A hormonal malfunction (otherwise known as PMT) and an Aries full moon have combined to make me a little…tetchy? A tad irritable? A little abrupt perhaps? Just a little. Or as the Bear exclaimed yesterday – “I think you’re being hormonal, over-emotional and unfair!” to which I agreed whole-heartedly. This surprised him, as it was the first time I had agreed with him in days. Even after I have given myself a good talking to – if you haven’t got anything nice to say, don’t say anything at all and things of that calibre (thanks Mum), I can still feel waves of irritation flowing out of my pores and teeth marks on my tongue. Like a petulant child, my mind recites lists of people and things that irritate me; I buy into it for seconds or minutes then fling the list away in disgust, only to sneak up on my mind compiling another list! What is with you brain? I suggested to the Bear that maybe a 12 hour session of Florence and the Machine would get me out of my funk – she has that wonderful, wild, hormonal feel to her don’t you think? He knew exactly what I meant – “I love the unbridled passion and energy of women, I really do”; thus confirming for me, yet again, why we are still together after 12 years and 2 children. Even if the whites of his eyes were showing, just a little bit. Why do some hormonal cycles pass smoothly by and some leave me exhausted and irritated? I suspect it has something to do with how successful I have been in creating enough space to freely express myself, mentally, emotionally, physically and spiritually. If there is an imbalance within myself, I will feel frustrated and stuck. It’s all very well to be wise and all-knowing in retrospect, but when you’re in the thick of it, somehow sensible solutions don’t spring to mind. If you look and listen though, there are always clues – seeds to your solutions. My first clue was a few days ago when my meditation group spent an afternoon learning about medicine wheels. Intrigued, I spent some more time the next day reading about them and learning about ways to make and use them. One of the ways we can use a medicine wheel is as a tool of balance. The 4 directions of the medicine wheel correspond to the 4 seasons, 4 elements and 4 parts of the human existence – the mind, body, emotions and spirit. 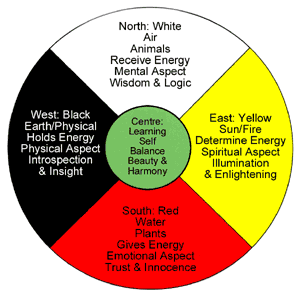 Medicine wheel – note that in the southern hemisphere North and South are swapped around. We are all born with a particular direction dominant within us. Our task, though, is to achieve balance in in all the elements. It became immediately apparent to me that while I am comfortable and expressive in the areas of mind and spirit, I have been suppressing my emotions and neglecting my body. OK, I knew this was a problem – I hadn’t been to a yoga class for a few weeks, and had been uninspired in my own yoga practice. Likewise with walking. 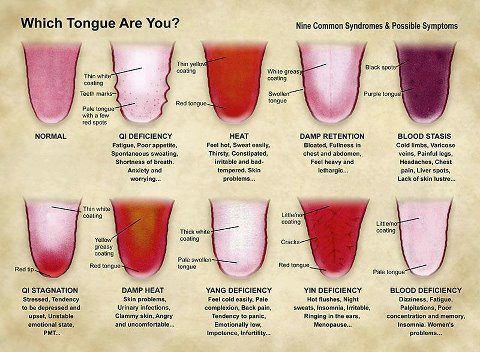 Tongue Chart – attractive, huh? I couldn’t help myself – tongue poked out, peering at myself in the mirror, wondering what kind of tongue I have. Anyhoo. It turns out that I have stagnant qi – qi meaning energy, stagnant meaning stuck. In my body, that will mean stuck liver/gallbladder energy. So back to the books (er, internet) to read up on stagnant liver qi. Ah yes. irritability, anger, PMT and other hormonal disturbances, moody, repetitive thoughts, aggressiveness. Headache, indigestion, nausea, heartburn, constipation, tiredness, sluggishness. All of these are symptoms of stuck liver qi. At the moment, I mostly only have the mental and emotional symptoms, but if I wait long enough, the physical symptoms will manifest as well. This is how the body works – there is always a mental and emotional component to every disease. First you are affected mentally (thoughts are very powerful), then emotionally (when you believe your thoughts) and if you don’t manage to deal with it there, you will get physical symptoms. Trust me. I know this to be true. So, now I know that I needed to move my body, and that I had stuck energy in my liver and gallbladder. So back to my research – now I was looking for a yoga sequence specifically designed to mover stagnant liver qi. I found this awesome yoga blog, and guess what? Spring is liver time, and I started feeling like this right on the Spring Equinox. The change of seasons is always a wonderful time to do a cleanse – my body is right in tune with the seasons. Excited about my new insights, I quickly made some dinner for the family (I wasn’t hungry and was feeling faintly nauseous – symptoms starting to move into the physical) and escaped to my yoga room to do the yoga sequence. What about you? Are you in balance? How do you know if you’re not, and what do you do about it? Definitely, Autumn is as powerful a time for a cleanse (and potential imbalance) as Spring. I just adore you. I really do. This is one of those times when I feel frustrated that I can’t just pop over to your house for the afternoon to exchange ideas!!! I love learning from you. Balance is something I struggle with. I’m following a program right now, which makes me stay in balance whether I want to or not. I laugh at how I truly tend to veer away from what I KNOW is right for me. Silly me. I LOVE this post. LOVE it, friend. 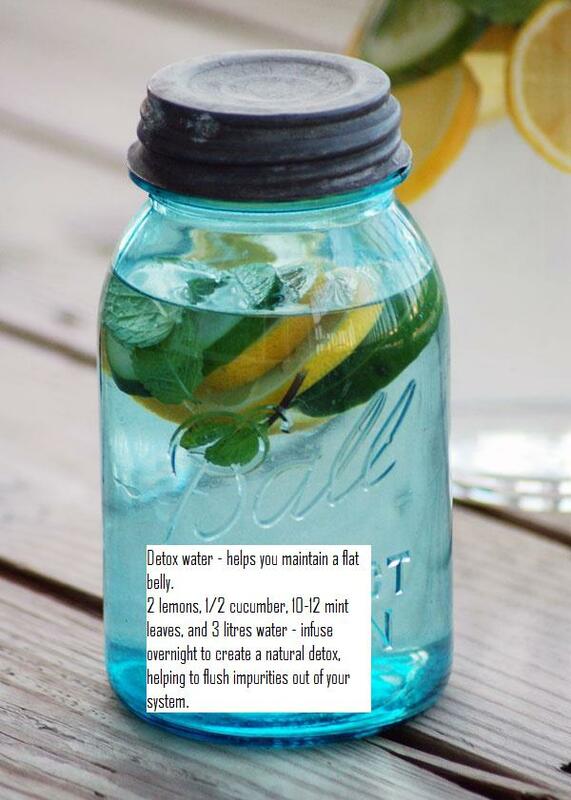 I hope your detox is starting to kick in, I am going to give your water detox a go. No way – balance this life! What a clever, thoughtful, intuitive woman you are. I’ve been out of balance for a while and I have to say that potion for a flat belly sounds delicious, I might just have to give it a go. I also take Evening Primrose, that seems to even me out a little. Yes, evening primrose oil! I forgot about how wonderful EPO is for balancing hormones.